In 2008, the Alter-Ciné Foundation received 88 documentary submissions from 28 countries. Yifan Li, a 42 year-old filmmaker from China, received the $10,000 award for his project entitled “The Year of Pork”. In the last year alone, the price of pork doubled or even tripled throughout China, thus threatening one of life’s basic staples for most Chinese people. Shot over the course of a year, this film tells several interwoven stories about key players in the Chinese pork supply chain who are anxious about the future of their industry. A pig farmer, a pig dealer, a butcher, and a pig-feed production manager all provide their particular perspective and insight about the food-supply industry, at this unsettling time in history. Chinese farmers have become the most vulnerable link in the chain, as industrialization and globalization are now worldwide trends. Yifan Li, recipient of the $10,000 Alter-Ciné Foundation grant. Diana Cuellar, recipient of a $5,000 Alter-Ciné Foundation grant. Diana Cuellar, a 39 year-old filmmaker from Colombia, received a $5,000 award for her project entitled “Mama Chocó”. Chocó is one of the worlds most abundant regions for water and natural resources. And Paulina is as fertile as the land of her birth. This mother of 26, midwife, and artist is filled with boundless joy and a love of life. One day a bomb explodes, forcing her to abandon her house and ancestral land. She leaves along with family members and neighbours. Like thousands of other displaced persons, she walks for months to reach Cali, Colombias third largest city, where she struggles to survive in a flimsy shanty made of wood, plastic sheeting and mud. She shares this fate with millions of displaced people who once fished, raised livestock and farmed for a livelihood, but who cant find work in the city. Through her songs, Paulina evokes her village of Bojaya and takes us on an imaginary journey across this bountiful region now destroyed by civil war. Her music echoes the voices of those who have remained behind. The film chronicles the pain of exile and the struggle to live in dignity in a place Paulina would finally be able to call Home. 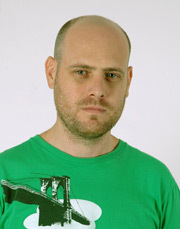 Jonathan Ben Efrat, a 35 year-old filmmaker from Israel, received a $5,000 award for his project entitled “Shock Therapy”. It is impossible to understand the process of privatization that has swept across Israel without some knowledge of the “Wisconsin program” – the program that led the way to the privatization of Israel’s employment services. The Wisconsin program has caused stormy debate. The film exposes the human puzzle, contrasting the optimism and the affluent world of the program's operators with the hopeless existence of the program's participants. It will demonstrate undergoing changes in Israeli society, from a state of solidarity to one of glaring social inequalities. Malian filmmaker Mamadou Cissé, recipient of a $5,000 Alter-Ciné Foundation grant. Mamadou Cissé, a 41 year-old filmmaker from Mali, was awarded a $5,000 grant for his film “Korafola, la joueuse de kora” (Korafola, the kora player). This film is an intimate portrait of Madina, a musician who lost her sight in 2002. Madina is the only Malian woman to play the kora, a traditional harp normally reserved for men of the griot caste who constitute the oral historians of ancestral culture. Infused with a passion for this instrument, Madina decides to flaunt tradition and to accompany herself as she sings, mostly about womens rights. That is, until the day her cousin convinces her to change her tune.